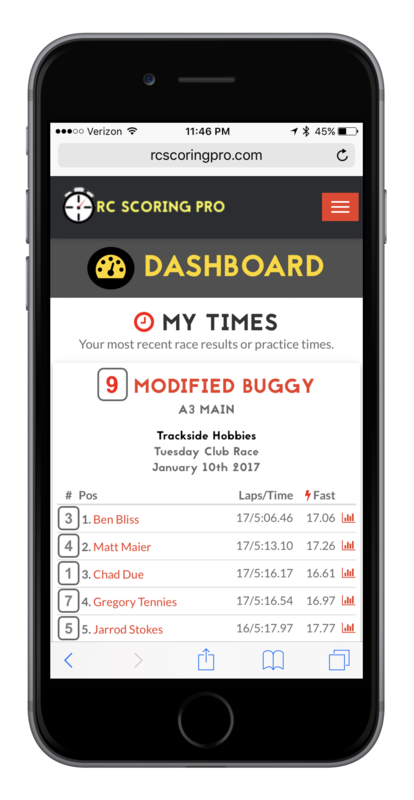 When you create an account and register your transponders on RC Scoring Pro, we can make sure your latest practice times and race results are only a click away. Easily hit one button to see results from your own cars, without having to look at all of the other races in each round. 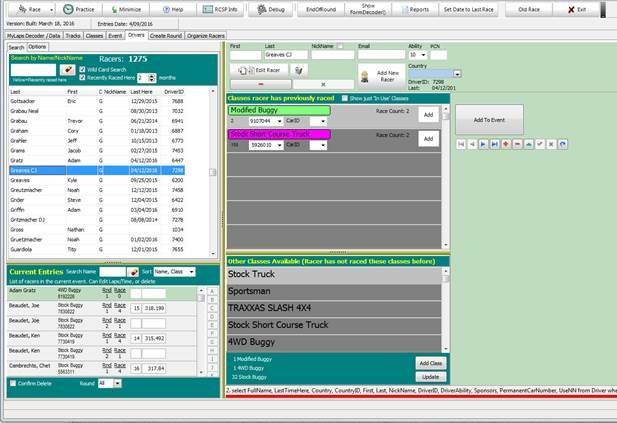 Show off your custom paint job and rep your favorite manufacturers on your results and the RCSP live video overlay. Check your run times, hot laps, and estimated pace from all of your practice sessions. Make notes on any session about setup changes, track conditions, or tire condition. Live-updating heat sheets, qualifying lists, and race results are available online for all racers at rcscoringpro.com, for free! No more crowds around the printout. Support for live video streaming alongside your scoreboard through Youtube, Twitch, uStream, and other streaming services. No advertisements, no special hardware to purchase, and most importantly no cost for the audience to view your stream. Mobile Friendly - RC Scoring Pro's online results were built from the ground up to work well on smartphones and tablets, as well as traditional PCs. Widget for track websites - embed live video and a live scoreboard on any website with ease. New Instant TQ panel on the right shows all qualifiers and their best qualifying time. Racers with numbers highlighted in yellow are in the current race, panels highlighted in green are improving their position and racers highlighted in red are losing positions. EQN (Estimated Qualifier Number) shows where the racer will qualify if they maintain their current pace. If the EQN is green, this indicates the racer is on their best run, and a plus sign means that they are improving their position. During a race with more than one class, each driver is colored by class so that it's easy to see who is winning each class. Top 5/10/15 laps can be displayed as usual, or the number of laps can be customized. If a racer just ran their fastest lap, it is now highlighted in red. Drag and drop racers from race to race, up and down in the same race, or into a different class. Change the order of the races by dragging and dropping the class name onto another class name. A lock icon appears on each race that can be clicked to stop that race from scrolling. 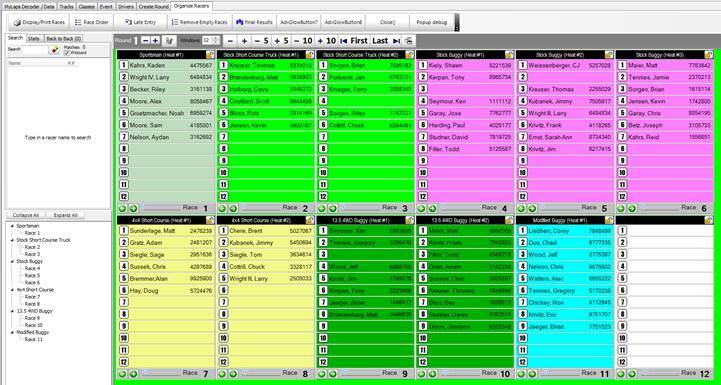 Each class can now be assigned a color, these colors will appear on heat sheets as well as printouts. Heat sheets,qualifying lists, and results can be automatically posted online. Wild Card Search - search for any match in the first name, last name, or nick name. Searching for ‘Sco’ will find “Scott Seymour”, “Eric Scogg” and a racer with the nickname “Scooter”, as well as “Jimmy Ascot”. Easily find your regular racers - if the "recently raced here" box is checked, only racers that have raced in the last few months will appear in the search. Convenient keyboard shortcuts - just type in the first initial + / + last initial. For example, typing "F/K" will find “Frank Krivitz” with just 3 keystrokes. Support for backing up to and restoring your racer database from the cloud, or importing a racer database from another track that's willing to share. 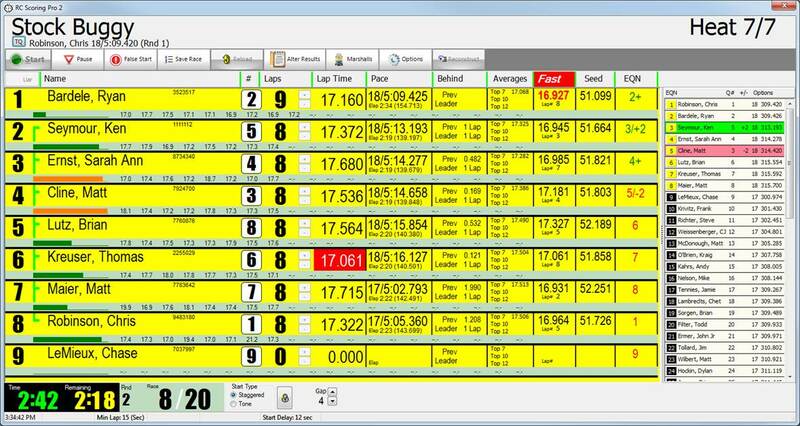 Each racer gets their own individual window, a feature invented by RC Scoring Pro and copied by other software packages. Racers can print a barcode sticker for their transmitter with only one tap, and scan the barcode to instantly see their lap times. Using a barcode reader is much simpler and more reliable than scanning a QR code with a webcam! Racers can also easily track their own practice times and compare them with the competition on the web. Subscribe now or contact us for more information or a free trial.